I’m happy that my article on the situation faced by musicians and singers in Tibet has been published online. 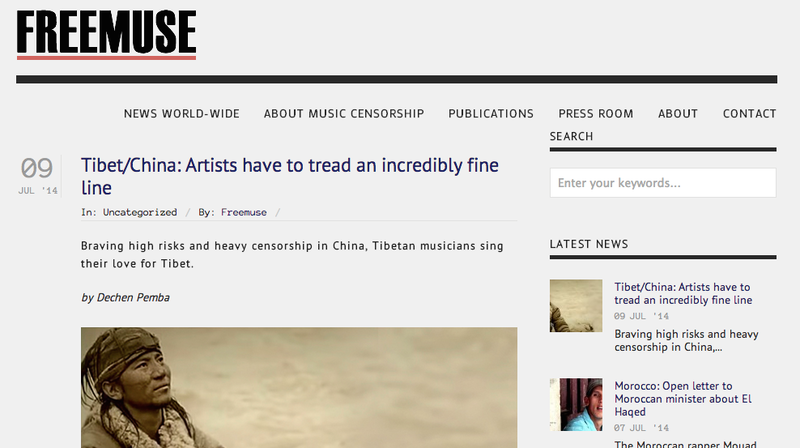 It was commissioned by Freemuse, the leading defender of musicians worldwide and Global Voices for Artsfreedom.org. One new development that only came to light after the article was published was that China responded to the UN’s February expression of concern about China’s detention of musicians. As reported by Free Tibet yesterday, “China has had to confirm that the musicians have been jailed for “separatist” activities”. Lolo, originally known as Luo Xiang, is a man of 31 years of age. He is a villager from the First Commune, Dhomda village, Chengduo County, Yushu, Qinghai Province. On the 26th of February, 2013, he was sentenced to six years in prison by the judicial organ on a charge of seditiously splitting the state with three years’ deprivation of political rights. At present, Luo is in the process of serving his prison sentence. Pema Trinley is a Tibetan man of 24 years of age. He originates from the Malma, Aba County, Sichuan Province. Chakdor, also known as Xuegduo, is a Tibetan man of 32 years of age. He originates from the Malma, Aba County, Sichuang Province. On the 3rd of February, 2013, these two people were sentenced to four years in prison by the judicial organ on a charge of seditiously splitting the state with three years’ deprivation of political rights. At present, these two people are in the process of serving their respective prison sentences. As many of you already know, the High Peaks Pure Earth weekly music video series is still going strong so please visit us there every Wednesday! This entry was posted in China, Global Voices, High Peaks Pure Earth, Internet & Blogs, Music, News, Tibet. Bookmark the permalink.